We hope your holiday shopping is going well! With last-minute shopping pressure starting to build, we thought we’d provide some more ideas for gifts for the musicians on your list. All of the great gifts listed below are now on sale during the Johnson String Instrument Holiday Sale! You can also find selected violins, violas, cellos, and bows on sale for 10% off at Carriage House Violins, plus sheet music, CDs, cases, accessories, guitars and other fretted instruments, and much more on sale now at Johnson String Instrument! This 1′ sterling silver Violin Pendant Necklace is very beautiful, and comes on either a 16″ or 18″ silver chain. JSI’s Flexi-Heads LED Stand Lights make great stocking stuffers! These CDs feature some of our very favorite local musicians! We can’t say enough about this wonderful new recording of unaccompanied Bach by violinist Daniel Stepner. On this CD are all of the Solo Sonatas and Partitas, as well as a stunning arrangement of Bach’s Chromatic Fantasy and Fugue. Stepner’s insightful and moving interpretations of these pieces are performed on three exceptional period violins: a Stradivari, an Amati, and a Kloz. A must-have for any violinist studying these pieces, Bach lovers, and collectors of solo Bach! Jason Anick is one of the best jazz violinists of his generation. Jason Anick: The Tipping Point. We love this band! The Klezwoods From Cairo to St. Petersburg…with love. The Klezwoods: The 30th Meridian. A virtuosic display by cellists in the Boston Symphony Orchestra! Visit our previous post, Gifts For Musicians! for more ideas! Welcome to Johnson String Instrument’s blog site, a place where information about stringed instruments and accessories, players and teachers, concerts and events, and more will be shared! Johnson String Instrument has served the Greater Boston string-playing community since 1976. With the acquisition of Carriage House Violins in 2013, we form New England’s largest string company, together with our Guitar & Bass Shops. We are one of the first and most prominent internet resources for string players, offering a vast selection of books, sheet music, Suzuki materials, cases and accessories, as well as electric stringed instruments, acoustic fretted instruments (guitars, mandolins, ukuleles, and banjos), and double basses for sale, plus violins, violas, cellos, and double basses for rent on johnsonstring.com. You can also shop using your mobile device at johnsonstring.mobi. Our extensive collection of violins, violas, cellos, and bows available for purchase can be viewed at carriagehouseviolins.com, the website of our bowed-instruments sales division. We hope you can visit us in person at our beautiful location in Newton Upper Falls, Massachusetts! Downstairs, at Carriage House Violins, you can play instruments and bows in private trial rooms or in our onsite concert hall. Please contact us at info@carriagehouseviolins.com to make an appointment with one of our knowledgable sales consultants. In the Carriage House Violins Workshop, you can meet with one of our talented luthiers about instrument restoration and repair, custom setups, and tonal adjustments. Our exceptional bow technicians provide expert bow rehairs, repairs, and restoration. Please contact us at info@carriagehouseviolins.com to schedule a consultation for a repair, tonal adjustment, or bow rehair! Upstairs, at Johnson String Instrument, set up a rental account, browse our selection of stringed instrument supplies, or try out the electric and fretted instruments. You can also consult with us about double bass and fretted instrument repair at the Guitar & Bass Shops. Contact us for more information at info@johnsonstring.com! We look forward to serving you for all of your stringed instrument needs! Our halls are decked and all is merry and bright here during the Holiday Sale at Johnson String and Carriage House Violins! Our friendly and knowledgable staff is here to help with gift ideas for musicians on your list. If you are in New England, we hope you can visit our beautiful new space in Newton Upper Falls, Massachusetts! Make an appointment to try violins, violas, cellos, and bows in our private trial rooms or recital hall at Carriage House Violins, or visit carriagehouseviolins.com to view our vast collection of instruments and bows. Starting a home trial for a player who needs a new instrument is a great holiday gift surprise! Upstairs at Johnson String Instrument, you can visit our Bass Shop, Guitar Shop, and Electric Instruments Shop to see our selection of double basses, acoustic guitars, and other fretted instruments, plus electric instruments for sale. We’ve also got a great assortment of accessories, cases, strings, and sheet music, too, on sale now through January 4. If we can’t meet you in person, we hope you’ll visit our websites at carriagehouseviolins.com or johnsonstring.com to order now for a speedy delivery! Below are some gift ideas for string players on your list. How can you go wrong? Available in any denomination and can be used in-store, online, or by phone. They make great stocking stuffers and are great for teachers! Wristies provide excellent warmth while keeping your fingers free! Made of incredibly soft and comfortable Polartec polyester fleece, they are water repellent, retain body heat, and wick away moisture. Highly recommended by hundreds of professional string players! The JSI Deluxe Violin Stands are beautiful handmade hardwood stands designed to hold a full-size violin and bow. The Deluxe Cello Stand holds a 3/4 size or full-size cello and bow. The wood is skillfully and tastefully decorated and finished with a golden brown varnish. The padded suede interior of the stand gently cradles the instrument, and comes in different colors. They provide easy access to the violin, as well as a stunning display for any home or performance environment. A great gift for anyone who wants to display their instrument beautifully! View a wide selection of models and colors on our website. Includes Bobelock, Core, Gewa, and more! Plus, receive 15% off a case and bow when you purchase an instrument and bow from Carriage House Violins! Plug in with exciting electric instruments by Yamaha, NS Design, or Realist. Plus, receive a free Johnson Artist Carbon Composite Bow with any purchase of a NS Design or Realist electric instrument! And, Yamaha violin and viola outfits are on sale! This makes a great gift both for the excellent rosin–the formula for which is based on an old Italian recipe–and also for the beautiful box it comes in, handcrafted from root of tuja wood, and precisely carved to-scale in the shape of one of Stradivarius’s famous violin forms! Specify violin/viola, or cello formula. 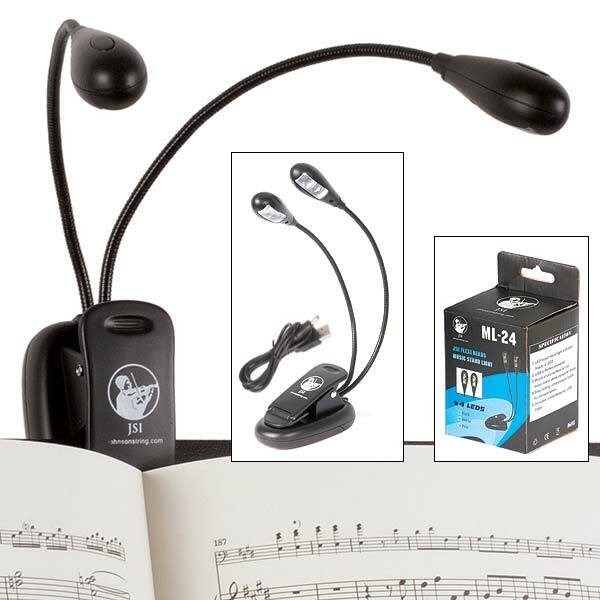 The JSI Super-Wide stand light illuminates four pages of sheet music with nine LEDs! Runs on three AAA batteries, power adapter (included), or USB. With two brightness levels, a flexible lamp post, and firmli gripping clamps, this light can be adjusted to accommodate virtually any lighting need! This manual for teaching and self-teaching is a must-have for the serious violin student! Watch our blog for more features during our Holiday Sale, and ask us about other great ideas for gifts for musicians!